In the dying days of World War II, Germany is a ravaged country, many of its cities bombed, its people struggling, its children hungry. Young Erich and his brother Hans reside at the Goldschmidthaus Children's Home brought there by their mother who c. But even there, food is scarce and the boys often go to bed hungry. Their mother while she struggles to earn a living for her and her sons. She visits them often and they look forward to her loving attention. And then one day she comes no more. The boys learn she has been killed in a bomb attack. The boys find themselves in the care of the Red Cross and Operation Shamrock where German orphans are sent to Ireland to be fostered there. Erich and Hans are separated and sent to different homes where they must learn a new language, learn to eat new food, learn a new culture, learn to fit in. Hitler and Mars Bars is a poignant, often heart-wrenching tale of Erich as he searches for love and family in the aftermath of World War II. Diane Ascroft's meticulously researched novel about this actual operation of the Red Cross is told through the eyes of young Erich. 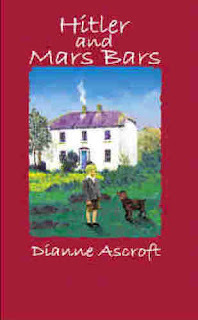 The gentle retelling in the simple voice of a young boy makes the reader ache for these children. She evokes strong emotion until the very end of the book where the reader is left deeply moved by the tremendous loss experienced by these children and their desperate search to find happiness in a world where family no longer exists for them. It is a deeply moving book recounting a part of World War II many people known nothing about. I highly recommend this book for everyone interested in history, specifically that which pertains to World War II. Erich’s home is a Children's Home near Essen. He lives for visits with his beloved mother and is distraught when, after a heavy bombing raid, they cease. After the war he is transported across Europe to escape the appalling conditions in Germany. Operation Shamrock brings Erich and his brother, Hans, to a new life in Ireland but with different families.